Western Orissa is home to many beautiful places. However, the Orissa govt. is promoting tourism only in the coastal belt of Orissa. Like many other sectors the tourism industry of western Orissa is in a sorry state. Thanks to Orissa govt.! 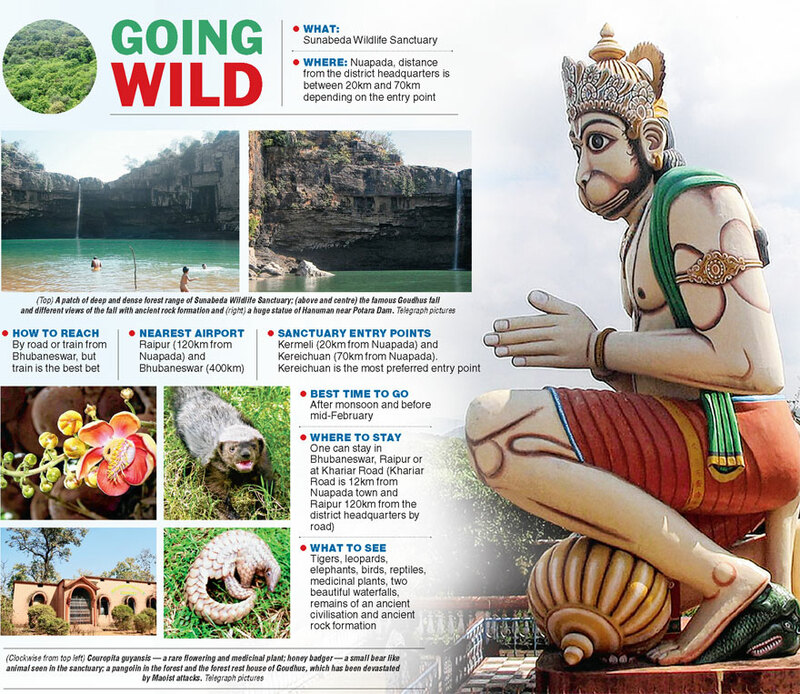 Bhubaneswar, Dec. 12: The Sunabeda Wildlife Sanctuary in Nuapada district has a beautiful blend of history, archaeological treasures, wildlife, rock formations, waterfalls and forest ranges rich with rare and endangered species of flora and fauna. Once the epicentre of the Koshala kingdom, the Maraguda valley near the sanctuary today stands testimony to the past with its archaeological remains. The table-top hill of Sunabeda has rich bauxite deposits. The valley, below the Sunabeda Wildlife Sanctuary along the Jonk river, has brick structures that date back to the time of the Koshala kingdom. Legend has it that the rulers of the Kalacheri dynasty, who hailed from the Jabalpur area, came to Tripur (also called Sripur) and the Maraguda valley was their territory then. While historian Navin Kumar Sahu has referred to the fact that the area could have been ruled by the Nala dynasty during the sixth and the seventh century, many historians also feel that the excavated remains of the valley belonged to the era between the ninth and 12th century AD. “Many historical remains may have been submerged under the waters of the Patora dam (Upper Jonk Medium Irrigation Project). “Historians claimed that the rulers of the Ganga dynasty, who ruled the coastal, central and eastern parts of Kalinga, had frequent battles with the rulers of the Kalacheri dynasty. King Ananga Bhima Dev III had attacked the Kalacheris and his son-in-law Paramadri Dev was killed in the battle. “Finally, during the rule of Narasingha Dev I, the western part of Kalinga came under the rulers of the Ganga dynasty,” said archaeologist B.K. Rath. Apart from its historic saga, the sanctuary, spread over 600 sq km, has two beautiful waterfalls amidst the ancient rock formation— Goudhus and Beniadhus. While there was a forest rest house in Goudhus, the eco-development committee near the Patora dam and the Jogeswar Temple of Shiva are the major attractions in the area. Reaching Sunabeda has now become very easy from Bhubaneswar by the Puri-Durg Intercity Express, which starts from Bhubaneswar at 7.15pm and reaches around 7.30 am the next morning at Nuapada, the district headquarters town. From Nuapada, the train departs at 7.15pm and reaches Bhubaneswar the following morning at 7.30am. Because of Maoist attacks, the forest rest houses are no longer habitable, so one has to stay at any hotel in Khariar Road, 12km from Nuapada. Ecologist Prasad Dash said: “The sanctuary falls in the western fringe of Orissa. There are three ranges— Nuapada, Komna, and Sunabeda —and the region is the catchment area of rivers Indra, Jonk and Son. The altitude of the area is ranges from 727metre to 1000 metre (Chouradongar) and there are 52 villages inside the sanctuary and 167 villages in the buffer zone. The forest land is characterised by a series of long hill ranges. Apart from three major rivers, the valleys are criss-crossed by nine major streams, 12 waterfalls and two springs. There are teak forests, amidst which there is a significant presence of animals like tigers, leopards, gaurs and nilgais. Sunabeda Wildlife Sanctuary has an excellent bio-diversity and an unique eco-system. It has the potential for great tourist attraction due to the wilderness in its natural condition, waterfalls, historical monuments and architectural ruins. The tract is an excellent research laboratory for the study of conservation biology of wild animals. To combat the environmental menace of Parthenium (Parthenium hysteroporus, the worst weed of the millennium), voluntary organisation Art of Living, along with Bhanja Sansad of Sunabeda, has launched an ecological drive. Another important feature of the sanctuary is that the Chukutia Bhunjia tribals living there protect different forest patches in terms of their sacred sights on clan-based living which supports the tiger population and could be assumed as a very common effort to conserve the big cats. “Bird watching at Maraguda, animal sighting near Borra, Bankiam, Datunama, Goudhus and Jamgaon, the presence of scenic landscapes in the form of waterfalls like Goudhus, Beniadhus, the presence of a reservoir and Rajiv Udyan at Patora help tourists relax. The wilderness at Kholibhitar, Beniadhus, Patdarha, Maraguda-Beniadhus stretch and Rasna are also to be experienced during a visit,” Majhi said. The ecological boundary does not coincide with the legal boundary in the reserved area. The issues of rights of people are yet to be settled and illicit felling, poaching, uncontrolled grazing, ground fire, man-animal conflict, fragmentation of corridor, lack of awareness, inadequate human resources and logistics, incentives for conservation and protection are to be addressed. Though incidence of insect-attack and pathological problems are less, change in land use pattern, poaching, scarcity of water during summer are some areas to be looked into.